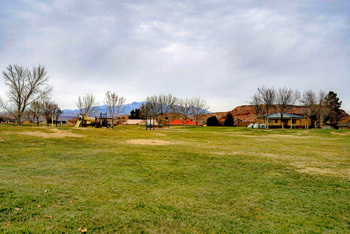 Bloomington Hills offers homes that are built out around the St George Golf course with most homes having been built in the 1990's and kept up well or renovated as needed. On one end we have Bloomington Hills South and the other end Bloomington Hills North. Each has its own park. The motivation to buy in Bloomington Hills are many. 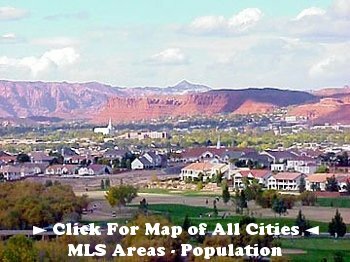 These include, awesome Desert Hills schools, an even mixture of BOTH young and old, views, parks, safe established area, paved walking, running and biking trails, edge of town adventures, variety of terrain and mixture of colors being the red dirt & rock, St George Golf Club, etc. 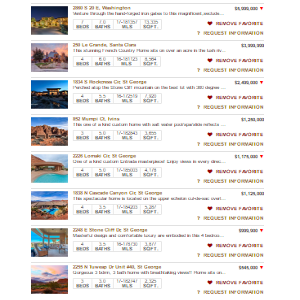 This search is a custom configured search unique to Bloomington Hills and auto-populates ALL the listings for this area. The listings in this area are composed of 3/4 homes and 1/4 condo/townhomes. The homes range in price anywhere from 250K on up to 350K, are 1100-2200 square feet, are built from 1975-2005, and about 9 homes per month are sold. When it rains and the dirt turns even a darker red and the sky lights up with a mixture of weather clouds and sunsets, then the air itself can seem to glow red and take your breath away. Most of Bloomington Hills while somewhat older, is quaint & pretty and is laid out nicely with access to to town two different ways, one by freeway, the other not. 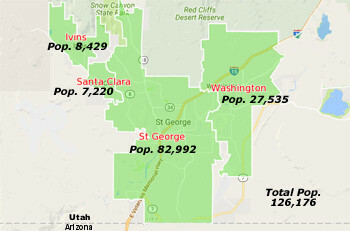 It has a myriad of churches and schools. The schools are not in the center, but off to the side or back through on Brigham Road, which road goes up over a hill to the freeway. So, it is sort of sheltered in its own pocket, just the right distance from the busy hustle and bustle of higher trafficked roads. You will not get a track housing feel at all in this neighborhood, not even close. All the homes are unique and different from one another, yet still seem to be kept nice. With the roads winding and curving you will feel this is a unique place and area to find your perfect home. There is not many for sale at one time and so values have held their own because of its seclusion and level of nicety. Bloomington Hills Park in the south has been nicknamed Circle park because it is shaped in a circle and the road goes right around it. It is big enough for a soccer or football game, plus some for swing sets with jungle gym and a basketball court and covered pavilion with picnic tables where many family or neighborhood cook outs are held. 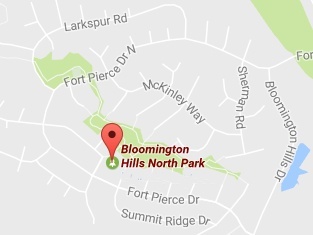 Kids are some times found safely playing night games while parents have a comfortable sense they are OK.
On the other end we have Bloomington Hills North Park that forms the center of that neighborhood. It is often referred to and appropriately nick named Long Park because it is a half mile long. It is a little hilly and narrow, but features lots and lots of grass and the walking trail diverges in two places to form two loops, so it is not that skinny in some places. It totals about 10 acres of grass. There are paved trails that feature benches to sit at when you get tired, or if you would like to take in the scenery of it or enjoy other park goers. Also, one can take in the variety of homes that back up to the park. A fair amount of joggers or bikers come through because it hooks into the rest of the trail system that feeds all the trails down in along Virgin River. Running enthusiast can go crazy. Many dog walkers can be seen. The park connects across Fort Pierce drive, to another small park skirting around 3 tennis courts called Larkspur park. These parks have lots of jungle gyms and swings and slides for little kids to enjoy and plenty of picnicking. 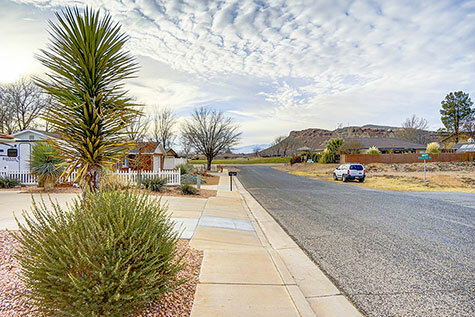 The homes in Bloomington Hills not only appreciate great parks, but also many of them appreciate great views of downtown St George with Pine Valley Mountain towering up and behind it. 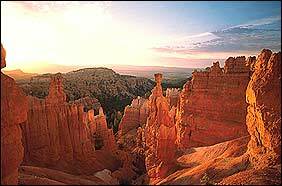 Also, many homes take in neighboring red rock cliff areas if not the park or golfing fairways. In the video below I am driving east on Brigham Road just past Bloomington Knolls and taking a left hand turn onto Bloomington Hills Drive. 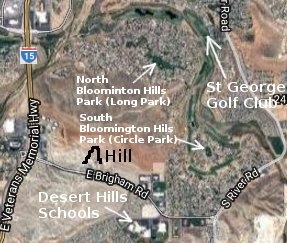 At the start I had just driven through the area of the Desert Hills High school and Bloomington Hills elementary. As I take a left on Bloomington Hills drive I am headed north at the southern part of Bloomington Hills South, and if I had kept driving I would be approaching Bloomington Hills North. Parts of Bloomington Hills North, to include Sienna Canyon, will ascend up onto the side of the hill offering a bit better views. 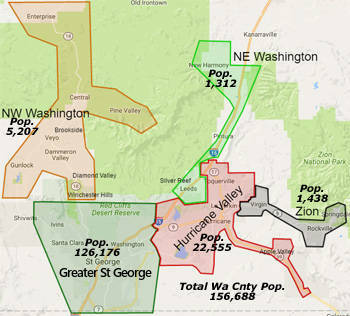 Bloomington Hills is composed of a good mix of middle aged, young and old. In one cul-de-sac the demographic profile is composed of one widow, 4 retired couples, and 8 families. Of those eight families two have young kids and the rest have middle aged kids or teenagers with at least one having left the nest. The homes are modest to nice with a couple more modern and contemporary. 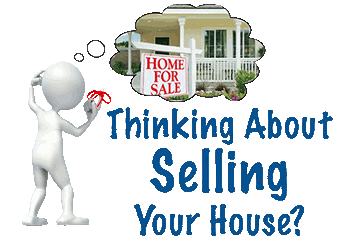 Please let us help you with your search when it comes time to look at homes in this or any other area. 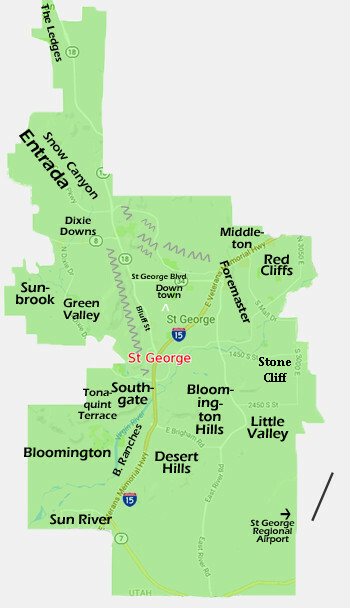 With our current Bloomington Hills market research we help you make informed decisions about homes in St George. This is an amazing market analysis of the ebb and flow of real estate market activity of homes in THIS area.